Make a batch of this Spinach Artichoke Dip for your next get together and watch the smiling faces crowd around with a chip in hand. 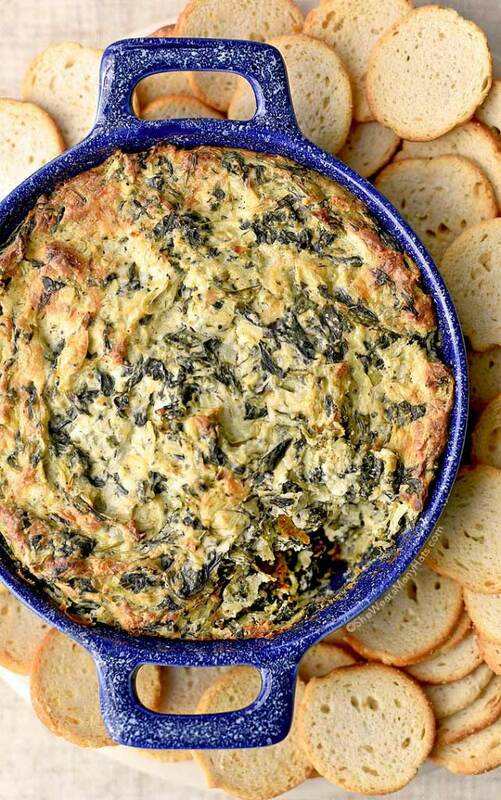 This easy Spinach Artichoke Dip recipe is a long-time favorite for so many. Slightly adapted from Perfect One Dish Dinners by Pam Anderson (one of my favorite cookbooks, by the way), this dip is warm and cheesy and full of great flavor. If you’re hosting a party, this dip is an excellent party food, and it makes a perfect appetizer to pack along for potlucks, gatherings, or tailgating. Plus, since there is spinach and artichokes involved, you can sort of count it as nutritious, at least partially. I guarantee this cheesy goodness will disappear very quickly. You may even want to go ahead and make a double batch. This scrumpdilicious Spinach Artichoke Dip can easily be prepared a day or two ahead of party time. The ingredients are fairly basic: cream cheese, mayonnaise, sour cream, grated Parmesan, shredded mozzarella, Italian seasonings, garlic powder, ground black pepper, salt, frozen chopped spinach, canned artichoke hearts. Most of the ingredients can be kept stocked and ready for impromptu entertaining. To prepare, mix all the ingredients together and refrigerate covered until ready to bake. When ready to bake, pop it in the oven uncovered until it has reached bubbly gooeyness. Once baked, it should be kept in a warm oven until ready to serve, as it is best served warm and melty. 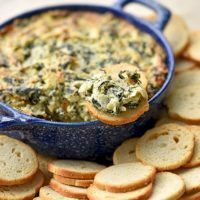 Spinach Artichoke Dip is great served with corn chips, tortillas, or my favorite, crunchy melba toast. Warm cheesy dip on top of crunchy toast … oh my! Leftovers, if there are any, are not only great for snack time, but try adding it to an omelet or as a topping for grilled chicken breasts. It really is a versatile flavorful dip. I hope you enjoy it as much as we do! 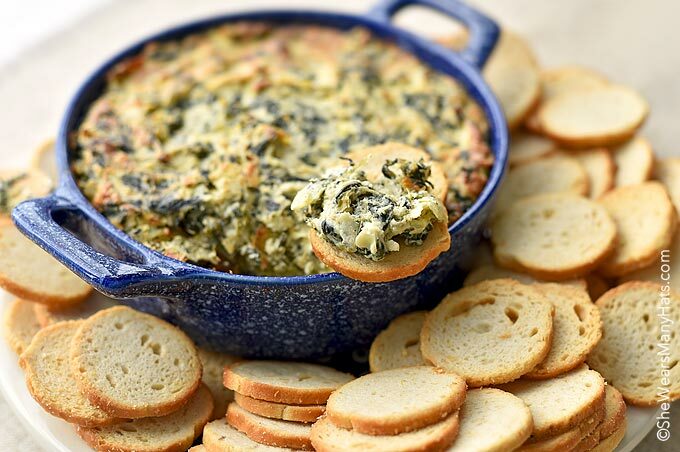 This favorite dip is made with spinach and artichoke hearts and is a delicious addition to any party food menu. Combine cream cheese, mayonnaise, sour cream, Parmesan, mozzarella, Italian seasonings, garlic powder, black pepper and salt together in a mixing bowl until incorporated. Add in spinach and chopped artichoke hearts and mix to combine. Transfer mixture to a baking dish and bake until heated through and bubbly, about 20-25 minutes. Adapted from Pam Anderson's Perfect One-Dish Dinners. This looks awesome. Love the presentation. Jon went grocery shopping for me this week and by accident bought frozen spinach instead of fresh. Providence! Now I have everything I need to make this. Thank you! I just LOVE artichoke dips. They are in my top 10 foods, if you can count a dip as a food. How perfect would this be on a game day? Saving this one. Thanks, Amy! Oh my word, I just want to dive right into this! What kind of bread or chips is best to serve with this? Thanks! Hello, Janet. I personally like pita chips or crispy bruschetta. What size baking dish do you use Amy? I only have larger casserole dishes and need to know what to buy so I can make this. Thanks. 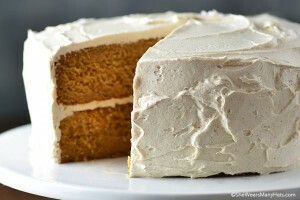 Thank you so much for recipe… I made this and we loved it. My grandma who don’t like artichokes loved it. I also freezed some since it makes so much and it was just as delicious warmed up!!! Keeper for sure!! ???? I made this a few weeks ago and everyone loved it!!! A keeper for sure and will be making again!!! Thanks for sharing your recipe!! One of our favorite hot dips! Looks yummy. Now I’ll have to make some! Thank you for making one without onions or onion powder, from us that are allergic to them.